These medieval coins from Mircea the Old belong to the collection of Mr. Dan Lange, through the kind permission of whom the pictures are present on Romanian coins. These silver coins were issued by Mircea the Old (cel Bătrîn), the most glorious and important of all Walachian princes. He ruled Walachia between 1386 and 1418. 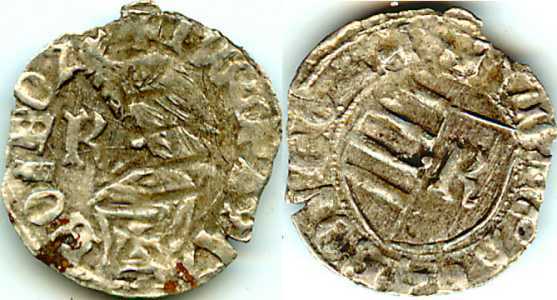 As type these coins are known to Romanian numismatics as Walachian ducats, as complying to the system of Venetian ducats struck in 1202 by Venice. 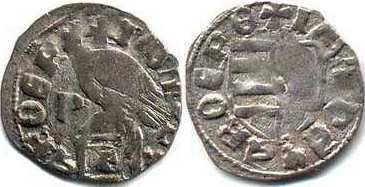 In which concerns their pattern (obverse - reverse), it belongs to the most common ducat type, type that occured to almost every coin issue of the Walachian princes, since Vlaicu I (1364 - 1377) to Basarab (the Old) Laiotă (1473 - 1477, with many interruptions). There are plenty of different variants in which concerns the legend, its respective fonts, the mint ensigns (usually both on the obverse and reverse, but different) and of course misspellings. When throwing an analytical eye at the Walachian numismatics, superficially even, a common sense supposition comes into mind, that most Walachian coin strikers could not read, fact that led naturally to the vast diversity of coin types. The legends on the coinage of Mircea the Old were written both in Latin and Cyrillic (Slavic). These ones use Cyrillic. The legends on the two coins, although different, were targeted at something like Iω MIRCEA VOEVODA - mispellings had their share again. The Bible of Romanian numismatics, Monede şi bancnote româneşti by George Buzdugan, Octavian Luchian and Constantin Oprescu (1976), presents the first coin on this page at number 170.